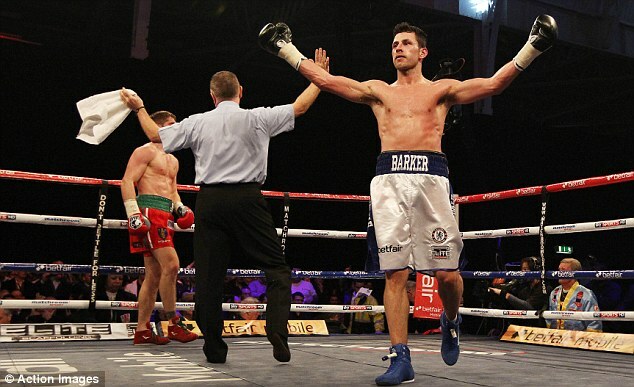 Darren Barker made a spectacular return to the ring and set himself up for a second world title shot next year with a convincing win over Kerry Hope. The 30-year-old middleweight had been out of action for 14 months since losing to Sergio Martinez in Atlantic City last October. But he made short work of fellow former European champion Hope at London's Olympia. Barker has had a year to forget after undergoing surgery to fix a long-standing hip injury before a return against Italian Simone Rotolo in September was shelved after he suffered torn tendons in his arm. Welshman Hope meanwhile enjoyed a fairy-tale win over Grzegorz Proksa in March to win the European title but lost it just four months later in a rematch. The 31-year-old beat Hungarian journeyman Norbert Szekeres over six rounds in a tune-up fight in Nottingham last month but was no match for a rejuvenated Barker. The opening round was a tense affair with both boxers opting for single shots with their lead hands as opposed to multiple-punch combinations. Hope tried to drag Barker into fighting at close quarters in the second session but the home favourite ended the round well by keeping his distance and working from the jab. Having shaken off the inevitable ring rust, Barker began to control the centre of the ring and march Hope down as he brought his right hand into play. And it was a hook from that hand that all but ended the visitor's challenge in the fourth stanza. Hope was floored against the ropes and although he groggily beat the count, his corner threw in the towel seconds later. 'I was a little frustrated in the first couple of rounds due to ring rust but it was enjoyable and I was glad to be back in there,' Barker said. 'I proved that I could still mix it; Kerry Hope is a former European champion and I've dismantled him quite impressively. If I had put in a bad performance, or lost, I would have called it a day but it's given me a lot of encouragement. 'I don't want to hang about in this game, I think I've got another three or four years left. I want the big fights and I want to be on the world stage. I've been at world level and I want to be back there. Earlier in the evening, Kal Yafai continued his seemingly inexorable march towards domestic honours and beyond with his sixth win from as many contests against Spanish champion Jorge Perez. The Birmingham bantamweight missed out on a place at the London Olympics but has taken to the professional ranks with considerable ease. This was his second eight-round contest after he dispatched Pio Antonio Nettuno in just 52 seconds in Nottingham on the undercard of Carl Froch’s world title defence against Yusaf Mack in November. And Yafai, 23, looked set for another very early night when left hooks to the head and body floored Perez at the end of the opening round. But the Spaniard beat the count and withstood several brutal barrages in the following two sessions only to be rescued from further punishment when referee Mark Green stepped in with just under a minute remaining in the third. Yafai will now top the bill in his hometown on January 19 alongside the next Prizefighter tournament and on the same night as stablemate Kell Brook fights Devon Alexander for the IBF world welterweight title in Los Angeles. 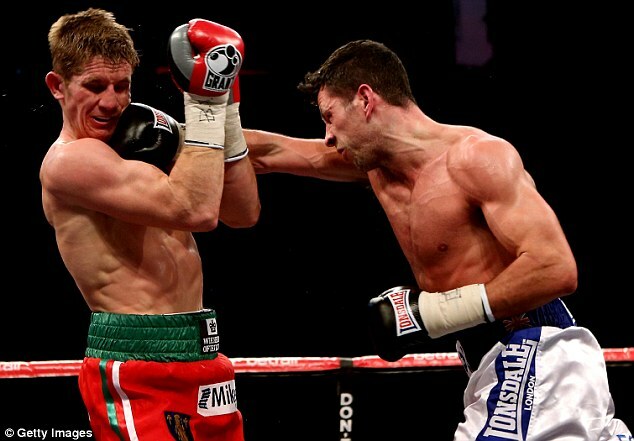 Also on the undercard, John Ryder won his British middleweight title eliminator against Irish Prizefighter champion and fellow unbeaten prospect Eamonn O'Kane. Ryder, 24, will now set his sights on the winner of Billy Joe Saunders' clash with Nick Blackwell at the Excel Arena next Saturday. The Londoner enjoyed the better of the opening rounds and, working from a southpaw stance, landed effectively with the right hand before a strong left rocked O'Kane in the third stanza. Rounds four and five were scrappy affairs but Ryder reasserted his dominance in the sixth although O'Kane did well to answer a powerful left with a timely reminder of a right hand. The decisive moment came early in the eighth round when yet another hook to the head had O'Kane struggling. He remained on his feet but a succession of similar shots forced referee Howard Foster to wave the fight off midway through the session. Meanwhile, American Carson Jones and late-replacement Dean Byrne fought out an entertaining draw which many ringside observers felt should have gone the way of the Dubliner. Jones, who lost to Brook in July, was scheduled to face Lee Purdy but the Colchester welterweight was forced to withdraw after failing to recover from a virus. Crowd favourite Erick Ochieng made a third successful defence of his English light-middleweight title with a hard-earned but largely uneventful points win against Max Maxwell over 10 rounds. There were also four-round shut-out victories for unbeaten novices Callum Smith and Martin J Ward while the popular Wadi Camacho made it six without defeat. 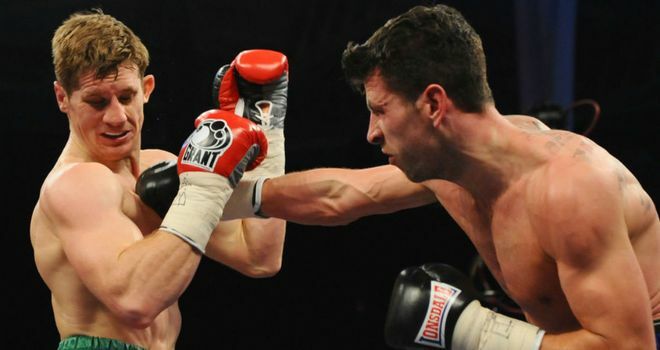 Darren Barker took 14 months of frustration out on Kerry Hope, marking his return from injury with an impressive fourth-round stoppage in London. By Rob Lancaster - Tweet me: @SkySportsLanny. Fighting for the first time since losing in his bid to win the world title against Sergio Martinez back in October of 2010, the middleweight showed there's still plenty of life left in him yet by recording his 24th professional victory. Although he understandably showed some signs of ring rust in the early stages, 'Dazzling' Darren did just as his nickname suggests as the bout wore on. Hope was by no means an easy outing after such a lengthy lay-off; the Welshman is a former European champion himself, and a tough nut to crack. That certainly proved the case in the first couple of rounds, Hope putting his head down and walking forward towards his opponent to get within range. However, by the third Barker had his timing working, allowing him to unleash the shots and then get out of the way of anything coming back in his direction. It seemed a finish could come about in the third when Hope was twice forced back onto the ropes, but instead it wasn't until the next that the Londoner thrilled his home crowd by putting his rival on the canvas. A short right uppercut was followed by a superb hook from the same hand that had the wide open Hope heading to the floor. He bravely beat the count but his corner decided they'd seen enough, throwing in the towel. "It is good to be back," Barker told Sky Sports afterwards. "We'd been working on the right hand and obviously with him being a southpaw the right hand down the middle is always a winner. "I was loading up a little bit too much, got a bit frustrated in the first round due to ring rust, but once I got my eye in I knew the opportunities would come and I found the opening. "Tony Sims got me in great shape again. I'm a late maturer and I think I'm finally finding my 'man-strength' and I it showed there." 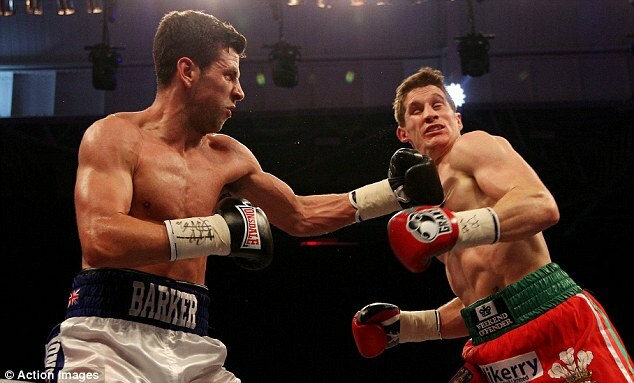 Barker will now hope to rise through the rankings and get another tilt at a world belt, something promoter Eddie Hearn believes will happen in the future. "We're just so pleased," he said. 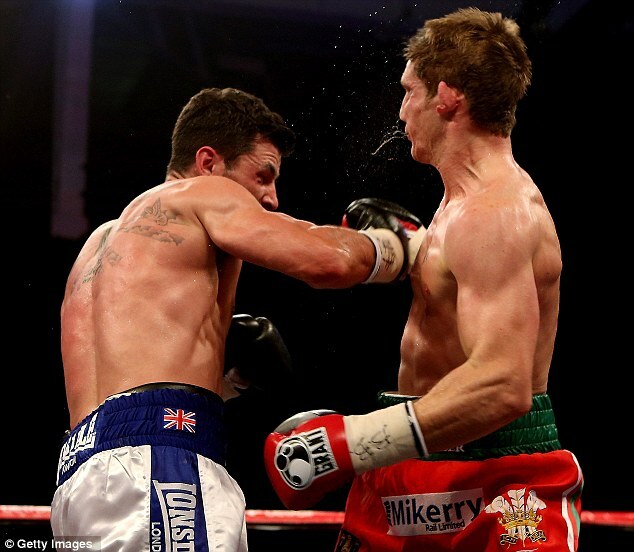 "Three months ago we nearly lost Darren Barker out of boxing. He was constantly having bad luck and we're so pleased we got him back in the ring, he's such a talent. "He can win a world title, I know he can. The key is to get him boxing regularly again and he'll be out again in March before hopefully a world title in the summer."